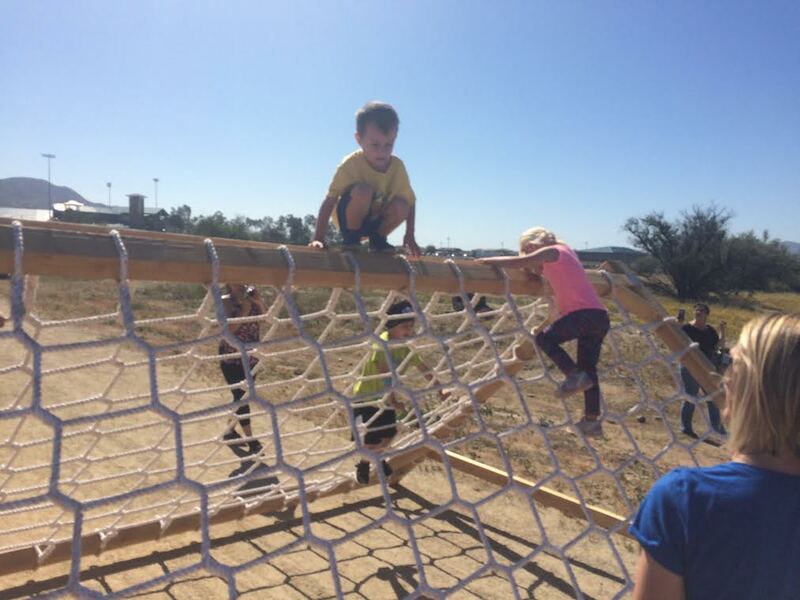 Terrain Mud Runs, for those unfamiliar, fit in a similar niche to Rugged Maniac – they offer competitive heats (and are an OCRWC qualifier race), but primarily exist as a fun family-friendly event. 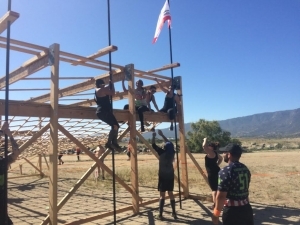 There is a lot less testosterone on the course than a typical Spartan Race or BattleFrog Series event, and for the most part this is reflected in their obstacles. 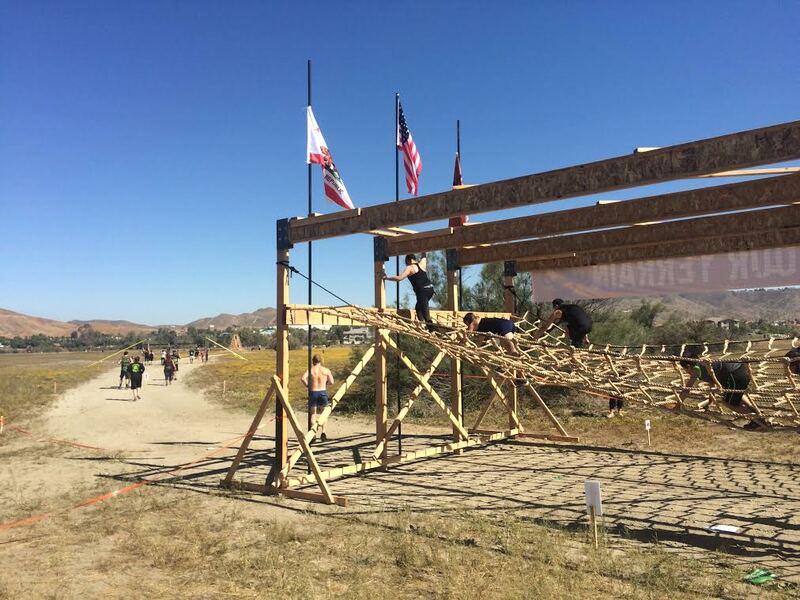 At the SoCal race, these consisted of lots of walls, a few carry/drag obstacles (most of which were on the 10k course), cargo nets, mud pits, and so on. On the more challenging end were a relatively short rope climb and a three-rope Tarzan swing where the challenge was to get from one side to the other without touching the ground. Then there was the final obstacle; a monkey bar/rig type setup with rock-climbing holds above water. 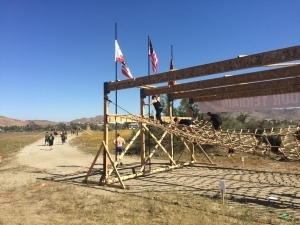 This obstacle was beyond tough, and many racers spent time doing multiple attempts at this one before giving up and making their way to the finish line. 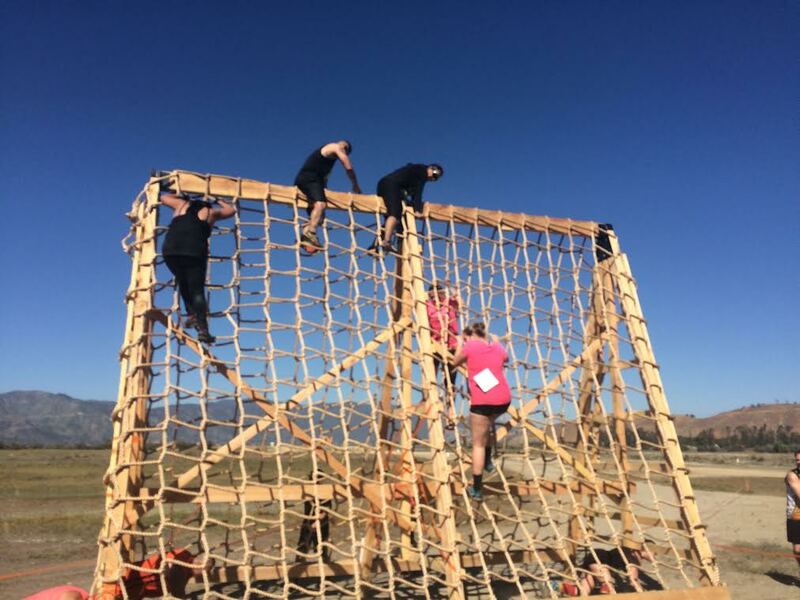 As such, this obstacle was also the center of a couple of major complaints – first, many racers felt it was “out-of-place” in that the difficulty level jumped so much compared to all the other obstacles on the course. It either needed to be toned back a little, or there should have been other tough and fail-able obstacles scattered throughout. This was not a complaint in the open heats where the biggest downside was a short swim, but in the competitive heats, it stymied many runners and lead directly to the second major complaint. 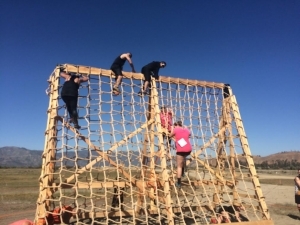 For a race series that touts “bands over burpees” and boasts mandatory obstacle completion in the competitive heats as a draw, there was very in consistent policing at this obstacle, and many athletes in the competitive heat who were unsuccessful at this obstacle made their way to the finish line with their bands intact. The venue at Lake Elsinor is very flat, and I thought Terrain Racing made good use of the trails and service roads, although it was unfortunate that they were denied access to the lake itself. Obstacles were well spaced and varied, and I love the fact that runners started each heat inside a pool; getting the athletes wet before they even began running. Missing this time around was another of their signatures; their miniature starting cannon, which apparently required special permits in California and attracted the Fire Marshall at a test firing earlier in the week. The festival area had a few local gyms and vendors represented, a nice shade tent for the biggest team (won by MROC Army, a local SoCal OCR and Ninja Warrior training facility), street tacos, and Dr. Bronner’s with their portable shower rig to clean everyone off after the race. Terrain has a large merchandise tent for a relatively small race, and had many different items for sale, from T-shirts and tank tops to water bottles, gym bags, and Wreck bags available on site (no shipping costs!). I didn’t love their finisher shirt this year; it’s an odd color that doesn’t really do anything for me, and I greatly prefer last year’s design, but their monkey medal has always been one of my favorites. Each year is a new design; this one boasts a spinning monkey head with either the 5k or 10k distance on it, and is considerably larger than most race medals (although a little smaller than last year’s huge offering). Overall, the competitive heats boasted some very fast athletes contending for the oversized checks. Other runners could choose between the 5k and 10k distances, and they added another option this year; for an additional $15, you could do multiple laps of the 10k course, and earn an extra monkey pin for each lap completed. 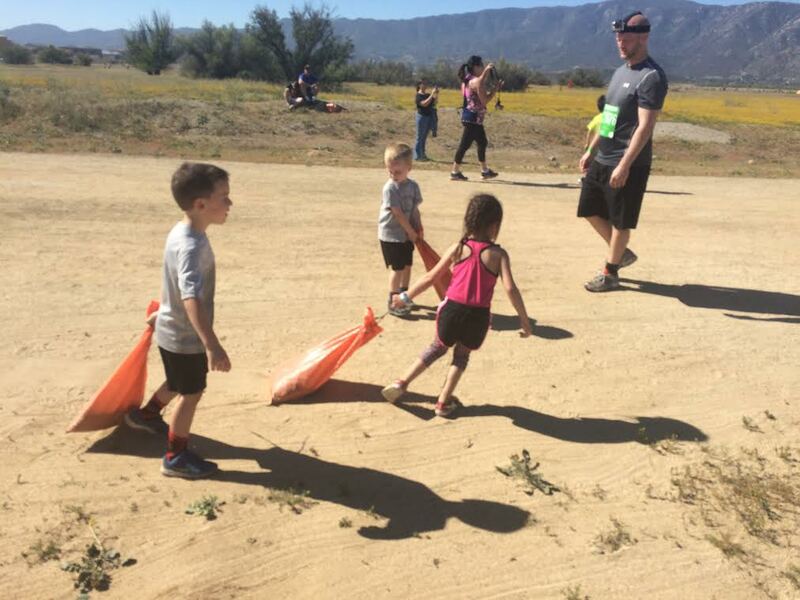 Terrain also had 1 mile and ½ mile kids’ courses for the very little ones – I’m pretty sure I saw multiple awesome OCR toddlers under 3 – and created a lot of smiles along the way for young and old alike. 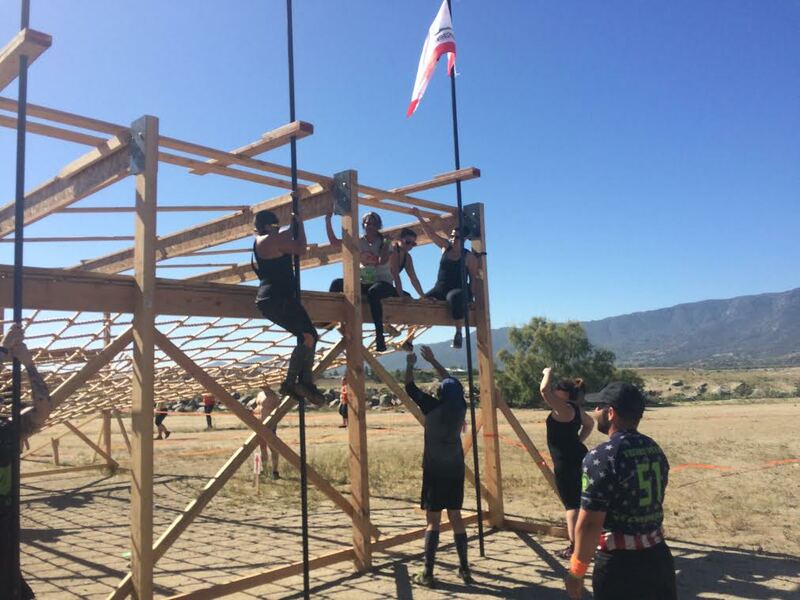 If you’re looking for the most brutal courses, hardest obstacles, and toughest competitors, you’re probably looking in the wrong place. 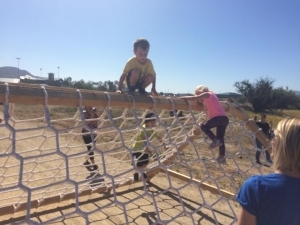 But if you want a fun, family friendly OCR which still does boast some tricky obstacles and also allows the competitive athlete to show their stuff, Terrain Mud Runs are a solid option. 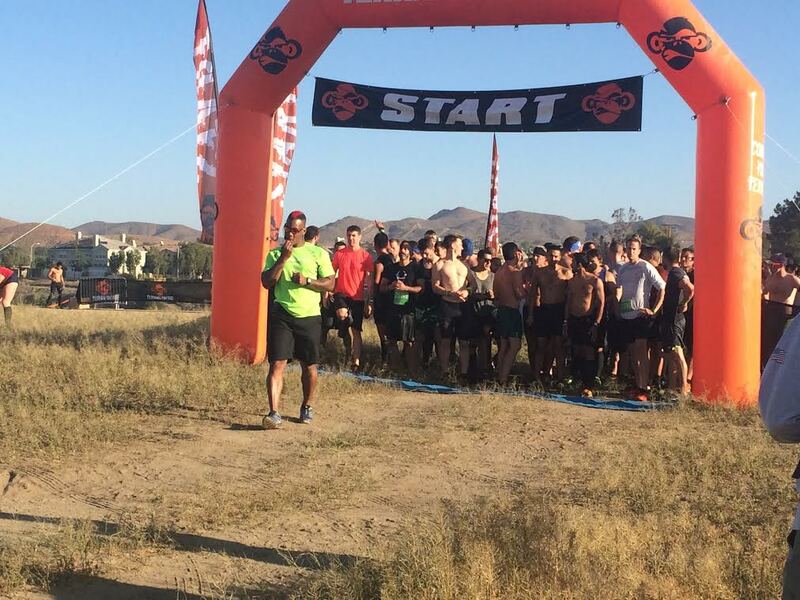 I’ll see them again in July at Fort Tuthill in Flagstaff for my third year in a row at one of my absolute favorite race venues. I was there and agree completely with the writer’s assessment of the Terrain Racing event. As a newcomer this was an excellent introduction to the sport. 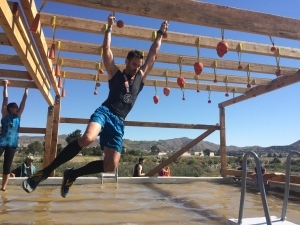 I look forward to my Warrior Dash in AZ this weekend and returning to Temecula in June for the Rugged Maniac at Galway Downs. If a competitive or elite runner complains about a difficult obstacle they should go back to running 5/10k road courses. As an OCR athlete we should be ready for any obstacle anywhere. An obstacle out of place? Too hard? WTF! I totally agree with the enforcement of the mando obstacle completion. If they say you will lose your band, have someone there taking bands.